Indies exclusive heavyweight red vinyl. 'Future Ruins' presents a band moving with real time and real life vitality, showcasing new tricks alongside classic hallmarks. 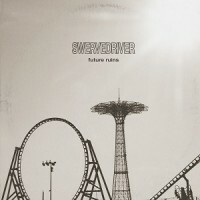 It exhibits Swervedriver’s fabled widescreen escapism, but with a tension that echoes the sleeve image of Coney Island in skeletal monochrome, like a post mortem photograph of a failed utopia. Barry says: Swervedriver do it once again, their shimmering dytopian drone meeting headfirst with beautiful shoegaze aesthetics and hefty songwriting prowess to craft an absorbing and enthralling listen.